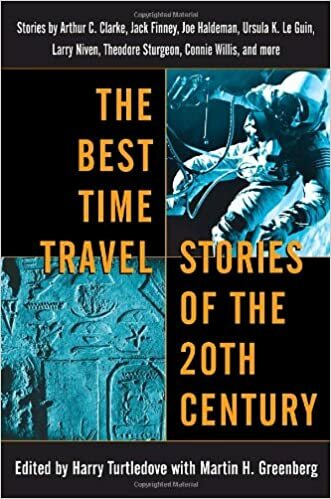 “Time’s Arrow” In Arthur C. Clarke’s classic, two brilliant physicists finally crack the mystery of time travel–with appalling consequences. “Death Ship” Richard Matheson, author of Somewhere in Time, unveils a chilling scenario concerning three astronauts who stumble upon the conundrum of past and future. “A Sound of Thunder” Ray Bradbury’s haunting vision of modern man gone dinosaur hunting poses daunting questions about destiny and consequences. “Yesterday was Monday” If all the world’s a stage, Theodore Sturgeon’s compelling tale follows the odyssey of an ordinary joe who winds up backstage. “Rainbird” R.A. Lafferty reflects on what might have been in this brainteaser about an inventor so brilliant that he invents himself right out of existence. “Timetipping” What if everyone time-traveled except you? Jack Dann provides some surprising answers in this literary gem. By turns frightening, puzzling, and fantastic, these stories engage us in situations that may one day break free of the bonds of fantasy . . . to enter the realm of the future: our future. space because there would have been a spatial constant. I mean, they wouldn’t have got smaller. Size is size. Moving a one-inch cube from here to Mars wouldn’t make it any larger or smaller.” “What about a different density in the surrounding medium? Wouldn’t that crush an object?” “Sure, and it’d stay squashed. It wouldn’t return to its former size and shape when it was taken out of the locker again. X plus y never equal xy. But x times y—” “So?” “That’s a pun,” Gallegher broke off to explain.